To resist against a black box, a primary condition for a projection, Kim introduces blackout curtain for stage or shooting studios. 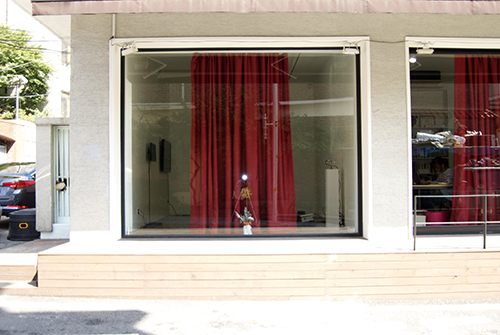 In Emily D.: The Latent Collaboration (2012) it was an installative element that suggests the context of theater or performative practice, while at space O’NewWall its functionality is maintained, partially blocking out the daylight. 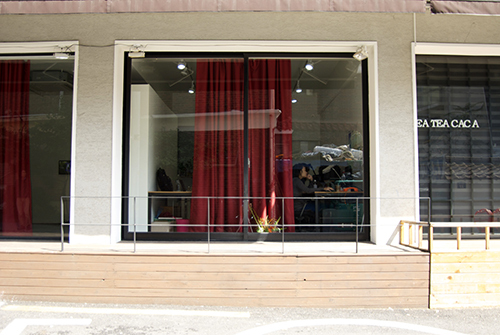 Since the curtain can be freely pulled, the in- and outside is not completely disconnected. 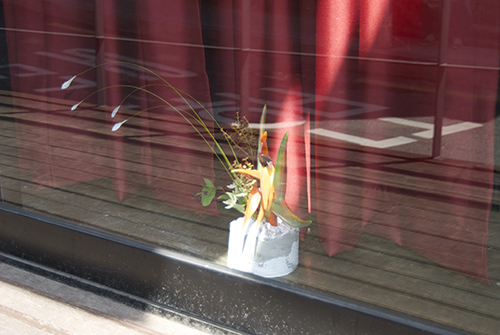 Between the curtain and the glass, Holy Grail Ikebana I and II are installed, inspired by ill-lighted German houses, whose windows often turn into a showwindow display with plants placed inbetween the curtain and window – the plants becoming mostly invisible from inside but only to be perceived from outside. 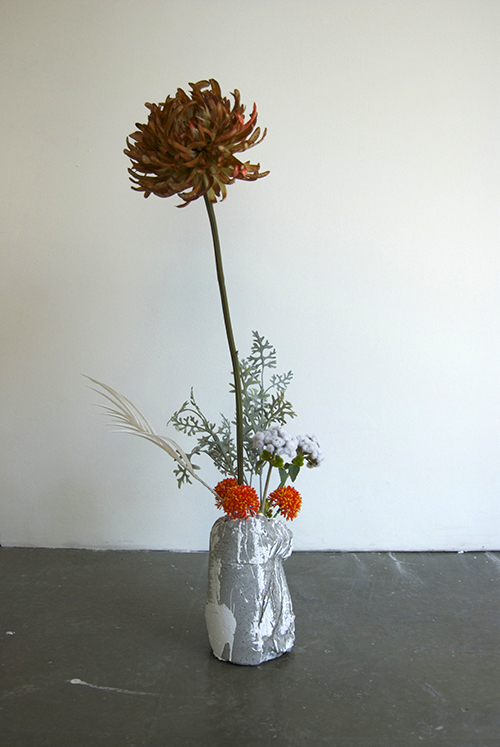 The selection of artificial flowers used in this work are not actually existing in their form or color, even though they are produced aiming a realistic representation of nature. 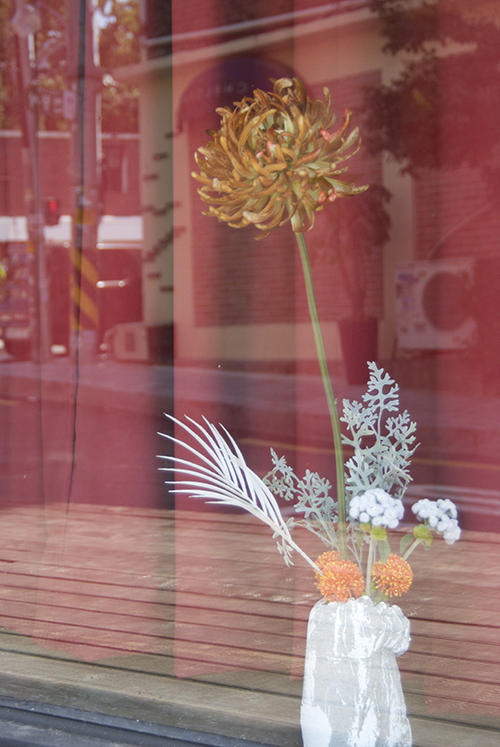 These are arranged mimicking the aesthetic of ikebana, that teaches to focus on a highly sofisticated use of each natural form, often through the skillfulness turning out to appear more manmade or manipulated. The vase where flowers representing different origins and climate are arranged, is roughly formed with cement and painted white, reminding paste brush technique in traditional pottery glazing, which values the accidental effect of a daring stroke. 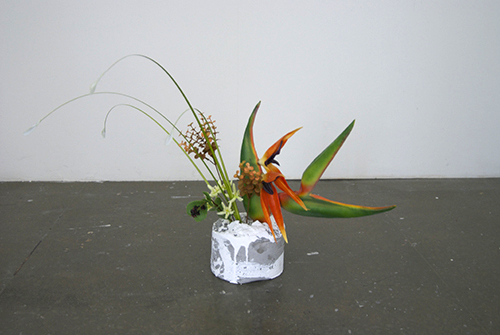 Holy Grail Ikebana I, II mimics artistic and industrial applicaition of ‘naturalism’ and names itself disparately as holy grail, opening up another possible view of the object and manifesting Kim’s frequent use of layered allegory. 영사의 조건인 블랙박스를 지양하고자, 작가는 무대 혹은 촬영 스튜디오에서 볼 수 있는 암막 커튼을 도입한다. 암막천은 2012년작 <에밀리 D.: 미분화 상태의 협업> Emily D.: The Latent Collaboration에서 연극과 퍼포먼스의 맥락을 제시하는 설치 요소로 사용한 바 있는데, 오뉴월에서는 실제로 햇빛을 차단하는 기능성을 띤다. 유동적으로 위치를 조절할 수 있어 내ᆞ외부가 서로 단절되지 않게 하였다. 커튼이 쳐진 전시장과 윈도우 사이에는 <성배 꽃꽂이 I, II> Holy Grail Ikebana I, II 가 설치된다. 채광이 부족한 독일의집들이 흔히 커튼과 유리창 사이 턱에 화분을 두어, 일종의 외부를 향한 윈도우 디스플레이가 되어 버리는 광경에서 착안한 작업이다. 실제로 존재하는 꽃을 본따 제작되었으나 그 색이나 모양이 변형되거나 과장된 것, 그리고 실재하지 않는 식물을 그럴듯하게 표현한 것 등을 사용하여, 무작위의 예술적 세련을 추구하면서도 극도로 인위적인 꽃꽂이의 미학을 흉내낸다. 서로 다른 계절과 지역의 꽃들이 뒤섞여 꽂힌 화분은, 시멘트로 거칠게 성형한 후 거친 붓질로 유약을 도자기에 입히는 귀얄 기법인 양 페인트로 칠한 것이다. ‘자연스러움’을 추구한 예술과 산업을 다시 한 번 흉내내면서 얼토당토않게 ‘성배’라 명명한 데서 중층적인 알레고리를 즐겨쓰는 작가의 성향이 드러난다.